What is the remote monitoring solution of AEDMAP ? 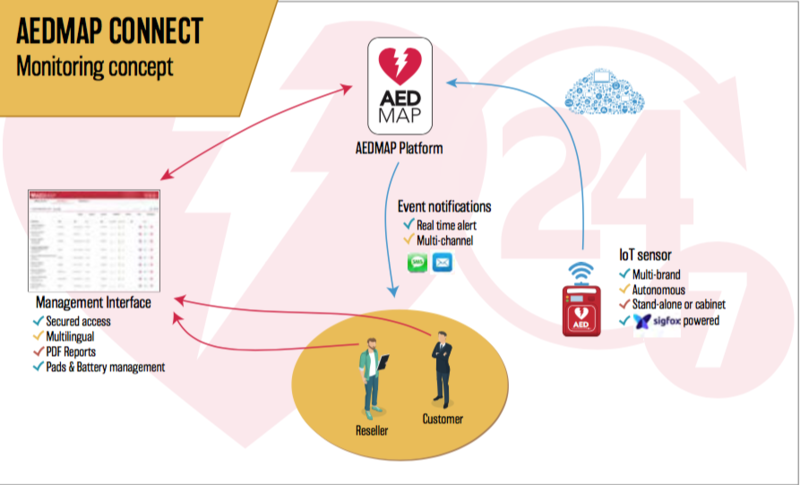 AEDMAP has developed a connected platform, using smart connected sensors to remotely monitor your defibrillators 24/7. AEDMAP monitoring allows you to be notified at any time in case of a malfunction of one of your devices. AEDMAP’s innovative solution is very easy to install, guarantees the AED proper functioning and protects you from any liability. How does this solution work ? The AEDMAP interface lists all the defibrillators, their serial numbers, reports any problems and alerts in case of planned maintenance operations. In addition to the alerts provided in real time, the status of the devices, which are constantly checked, are recorded in a dematerialized register and are provided to you in a monthly report. All information concerning the condition of the equipment and the maintenance operations are accessible through Internet. The AEDMAP monitoring solution is compatible with all the brands of defibrillators (Zoll, Philips, Heartsine, Cardiac Science, Schiller, Bexen…) and guarantees you a total control over your maintenance data. The Connect solution monitors defibrillators via IoT networks (SIGFOX) without any wired connection. The main benefit of this solution is to offer IoT services through communicating objects with low throughput and low energy consumption. AEDMAP defibrillators management solution is a comprehensive answer designed to handle the problem of Sudden Cardiac Arrest.